Dove Men+Care Extra Fresh Body and Face Bar has an invigorating scent, and has been clinically proven to fight skin dryness. 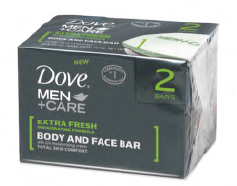 Dove Men+Care Extra Fresh Body and Face Bar has been specially formulated to cleanse men's skin, removing dirt, oil, and grime from the face and body. It has an invigorating scent, will not leave the skin feeling tight, and has been clinically proven to address dry skin. Suitable for use in the shower everyday. Fit into my hand nicely. Very easy to use. Lathered up well and left my skin feeling rather smooth. It would be good if you could get a plastic container to store it in to suit the shape of the soap, but I liked the simple packaging. Individually boxed, this has an extra fresh invigorating scent thats almost citrusy. The body and face bar has a creamy consistency to it once lathered and is not dry or hard like most soaps. It left my body and face feeling refreshed without the dry feeling that ordinary soap gives and rinses off easily. The soap bar is contoured so its easy to hold and makes it easy to use when showering. I will buy this again its one of my favourites in the Men Care range.  This is simply a great bar of soap, I really enjoyed using this product. The package it came in was good, tells you everything you need to know about it without going to ludicrous detail. Opening the package you'll find a nice big chunky bar of soap. I definitely appreciated having a bigger bar like this, the shape fits into my hand perfectly and makes it easy to grip. When you use the soap it creates a nice smooth lather, not foam everywhere. The soap bar itself will not slowly melt away if left in the soap dish or break in half, it is always a solid bar. The smell from this soap is great I really liked it. Would I buy it again? Yes this is my new favourite soap! I am generally unfussy when it comes to soap, I have to admit to just using whatever is bought for me. This Men's+Care soap is distinctly male, it has a certain spiciness to it, so I wouldn't recommend it for females – my girlfriend said it was too manly smelling for her to use. It just looks like a regular soap shape/size wise. It's a light khaki colour, and lathers well. I like the scent, and this does linger on the skin. It definitely does its job in the cleaning department, and it's not drying to the skin on your body. Although it was a little drying to the face, it's fine as a face wash in a pinch. I would buy again. I received the product from the trial team with Smp-kitten. It is really very good product and also want to say that I loved this range designed by Dove for man. It has great leather and smell, not to strong as always a man want. I always love Dove Body and Face Bar and only thing I don't like in Dove Bar is that they disappear very quickly. In this new bar Dove solved that problem. The product smells fresh and invigorating. It leaves the skin feeling smooth and moisturised. It did not irritate my skin. I usually prefer not to wash my face with a bar of soap, but with this one its actually quite good, leaving the face smooth and moisturised. The packaging looks very appealing and I really like the boxes as opposed to the 'normal' plastic packaging. It is easy to use, you don't have to rub the soap for a long time before it soaps up your washing utensil. Use during daily showers and baths, washing both the face and body. I'm not a big soap user as I've always found it too drying for me. I usually shower with whatever my wife has put in the shower to use, always a body wash/gel. This is quite a nice soap though. I've been using it the past 3-4 weeks and my skin hasn't had any irritation at all. It's a very moisturising soap and again, like the other Dove products in this range, the scent was very clean, fresh and not at all overpowering. It had a good smell for a man's soap. I only used this on my body and because I'd used it and had contact with my body, I didn't put the soap anywhere near my face. But from the feeling of it, I'm sure it would work perfectly on the face area. This soap had lots of suds, I was really impressed by this product and I will buy this again. The strong packaging made me feel this was clearly a man's product. It smelled great, lathered well and fitted perfectly in the hand. The fragrance was long lasting. I am probably more used to a less moisturising soap, so the sensation of a moisturising soap was a bit alien for me, and I did feel a bit as though I had a 'film' over me, rather than feeling squeeky clean - more so when used on the face than the body. This product had a mild fragrance similar somewhat to the body and face liquid wash. There is quite a smooth feel to it, but in no way greasy or oily. This product is exceptionally easy to use; everyone knows how to use soap. This is a 'real man's' product, no fuss, no gimmicks - the formula is good for your skin but all of that stuff happens in the background and just lets you get on with using a bar of soap. The soap makes me feel clean, simple as that. It is gentle on the skin, so there is no issues with drying out the skin. The soap feels familiar and you don't need a shower tool to use it, so for me it is more efficient and 'manly-er'. I would purchase this. I haven't used soap in years because I always found it awkward to hold and lather up, plus it dried out my skin. I prefer body wash, so instead of using this like a normal bar of soap, I used this on my shower puff. Surprisingly it lathered pretty well, did a good job of cleaning and smelled much better than the Deep Clean body wash. I still prefer the convenience of body wash over a bar of soap but I did prefer this scent. I like the packaging of the soap. The soap itself isn't too bad, it's not a messy bar and doesn't leave much residue in the shower. Not sure about the smell though. Compared to the original Dove products (soap), the smell isn't that pleasant. The soap felt nice on my face and body. The soap was easy to use and I could grip the bar when wet without it slipping. Very afforadable and I'd probably but it again. I like the size and smell of this soap. It has a subtle smell - doesnt foam up too much but becomes a velvety lather that feels great on the skin. After rinsing off the skin feels clean and fresh but not tight or dry. I like the simple packaging and the price. Perfect for showering when you dont want to use body wash - when I travel for work I find soap easier to pack (doesn't leak) and I hate those tiny hotel soaps!! I'd recommend using this soap - I've been using the same bar for over a week - lasts really well - great value for money in my book. Has your man missed the metrosexual boat?